TIMAC AGRO France, leading supplier of phosphate fertilisers in France, launched last June a tool dedicated for tablets and smartphones, filling a gap in the market. Designed for phosphate fertilisation, this free tool is available to all and has as its goal to create awareness, help in decision making and take part in a commercial relay. “We started from a rather alarming realisation, that there was an overall impoverishment of soils in phosphorus. In the past years, a lot of farmers have been leaving aside the fertilisation of phosphate without realising the risks they were taking to their crops. 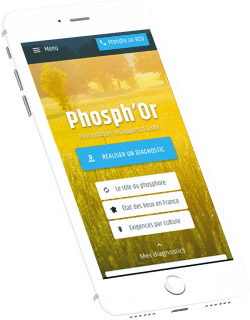 And in the field, there was no advising tool that was up-to-date.” recalls Mickaël Laune, Operational Marketing and Communication Manager at TIMAC AGRO France about the Phosph’or app developed in 2017 by the Group. Available on smartphones and tablets, the app was developed for direct use by farmers. It consists of two modules: a teaching module on the interest of phosphate fertilisation and another dedicated to the individualised diagnosis of phosphorus fertilisation. With the latter, the farmer is asked to provide information for the plot he wishes to diagnose, the results of his soil tests, the details of his last phosphorus intake, soil type, pH, location, and its performance objective among a choice of forty different cultures. In less than a minute, the app presents a recommendation. If the farmer does not have a soil analysis, he can locate – manually or by the integrated GPS function – the parcel that he wishes to diagnose and obtain advice according to the cantonal databases of INRA (1). The recommendations are based on the Comifer method (French committee for the study and development of rational fertilisation), recognised and proven by profession. Two months after the launch, on June 1st, 2017, and approximately twenty articles published in the agricultural press, the app had recorded 1,700 downloads in Google and Apple-store. “It took us four months to develop this app. We were able to do it so quickly because we had already developed the know-how,” says Mickaël Laune. Historically, the Agro supplies Direction Normandie-Centre de TIMAC AGRO France had already constructed their own tool. It is a ruler, still in field service, which offers the same diagnostic and recommendation features as the current application. The app is largely inspired by this ruler and was also thought of as a commercial tool. In fact, following its diagnosis, it can offer farmers the most appropriate amendments from TIMAC AGRO France’s range. A contact form available on the app then allows the users to get in touch with a commercial team of TIMAC AGRO France. In the field, the TSAs/ATCs (Technical Sales Agents) can also use Phosph’or as a tool to sensitise their customers on the lack of phosphorus in their soil. They realise in a few moments a first diagnosis with the farmer. TIMAC AGRO France also hopes to gather data on soil fertility. In the long run, this data could, after analysis of their reliability, help refining the soil mapping of INRA. In the end, the app would become even more relevant in the diagnosis of phosphorus needs and the recommendation of customised solutions.